time 10am to 5pm Monday to Saturday. Open on public holidays. The Origins Centre take visitors on an extraordinary journey of discovery, which begins with the origins of humankind in Africa, and moving through the development of art, symbolism and technology on the continent. 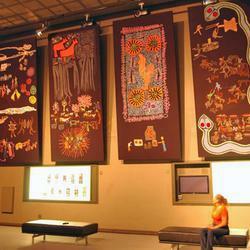 The exhibits explore the diverse southern African rock art traditions – the world’s oldest continuous art forms. The museum houses artworks that rediscover the ancient masterworks in a contemporary world. On our premises we have the museum, education centre, Cafe Fino restaurant which has a children's menu, a craft shop, and a fantastic Africana book store with lots of great books for all ages. The museum offers a hands-on learning experience for kids to learn about the history of modern humankind. Children will love being able to handle the replica hominid skulls that are tucked away, waiting to be discovered. Origins is proud to announce the arrival of a collection of dinosaurs and early mammal fossils. 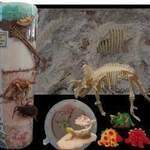 See dinosaur eggs and life size dinosaur models. We offer also fun 'ancient painting' workshops, and a range of workshops linked to the school curricula. Family activities in the museum. We have regular family fun days at which a variety of activities available - all designed to entertain and educate children of all ages (and activities change from month to month). Activities include: archaeological dig, art activities, treasure hunts, weaving, stone tools, music with stones, and dinosaur puzzles. They will have the chance to interact with archaeologists and learn more about this interesting career.